April 20, 2015, 3:43 p.m.
A family in Maryland has had another run-in with the authorities after they let their two children, aged 10 and 6, go to a local park by themselves. This case, and others where parents have had to deal with the police or Child Protective Services because they allowed their children to do certain things alone, have highlighted that most American children today are rarely unsupervised. Experts note, however, that not only are children safer today and less at risk of being a victim of crime than in prior decades, but that the biggest threat to children is often from family members, not strangers. 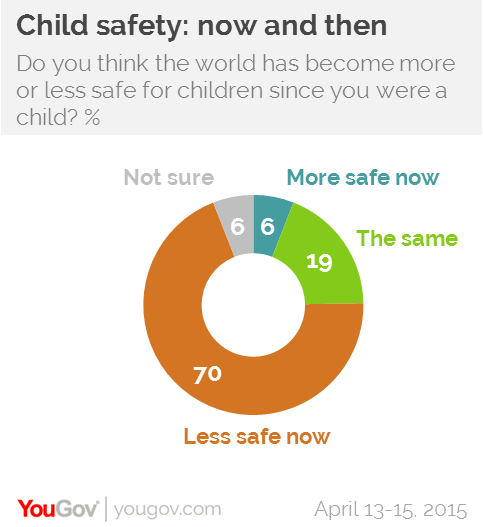 YouGov&apos;s research shows that despite these changes the vast majority of Americans think that the world is less safe for children today than it was when they were growing up. 70% say that it is more dangerous now, while 19% say that it is about as safe as it was when they were a kid. Only 6% say that it is safer now to be a child. Asked whether they would allow elementary school aged kids to do certain things which, in general, were normal for them to do even a generation ago most Americans say that they would not. 59% say that they would not allow a kid to walk to school alone, 62% would not allow a kid to play in the neighborhood without supervision and over 70% would neither allow a kid to go to the park alone nor to the store. 80% say that they would not allow an elementary school aged child to use public transport alone. Despite widespread opposition to allowing elementary school aged children to do these various things alone, most American adults say that they were allowed to do almost all of these activities alone when they were in elementary school. 66% played in the neighborhood unsupervised, 59% walked to school alone while 54% went to the store and 53% went to the park alone. The major exception to this is using public transport alone, which only 30% of American adults say that they did as schoolchildren. Americans under the age of 30, however, tend to report that they were not allowed to do these various things alone when they were elementary school aged. 47% of under-30s were allowed to play in their neighborhood unsupervised while 45% were not, but a majority of under-30s report that their parents forbade them from doing anything else alone.